Microsoft’s Surface Book 2 is the most powerful mobile Surface device yet. It easily blows away the Surface Pro, Surface Laptop and, of course, the old Surface Book. It’s also one of the odder devices in the lineup, though. It’s not just a Surface Pro with a rigid keyboard. It’s a relatively heavy base with a powerful processor and graphics card and a big battery — and it has a surprisingly light removable screen that turns it into a tablet and that features a less powerful processor and graphics chip. Microsoft shipped me a top-of-the-line 15-inch Surface Book 2 review unit with the latest Intel Core i7-8650U CPU clocked at 1.9 GHz, a discrete Nvidia 1060 GPU with 6GB of RAM, 16GB of memory and a terabyte SSD. That’s $3,299 worth of Surface Book, though at the low-end, you can also get a 13-inch machine for $1,499 with an i5 processor, 8GB of RAM and an integrated Intel GPU. In between, there are a number of other 15-inch models with Nvidia 1050 GPUs and varying numbers for RAM and disk space. There surely a world of difference between the performance of these low-end and high-end machines, so you get what you pay for. 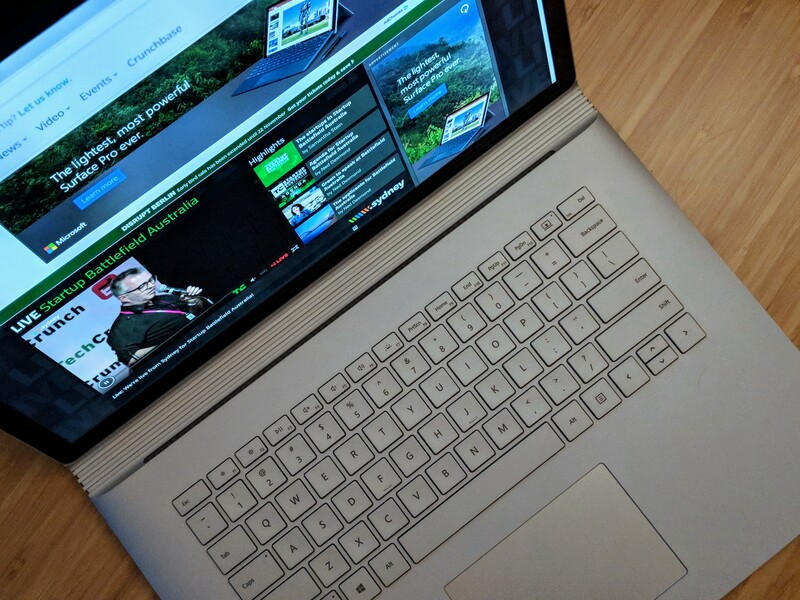 But Microsoft’s message here is pretty clear: the Surface Book 2 is basically a mobile workstation for those who want to edit videos and photos, play games on the road or just need a really powerful mobile machine to crunch numbers or compile a Linux kernel or two. 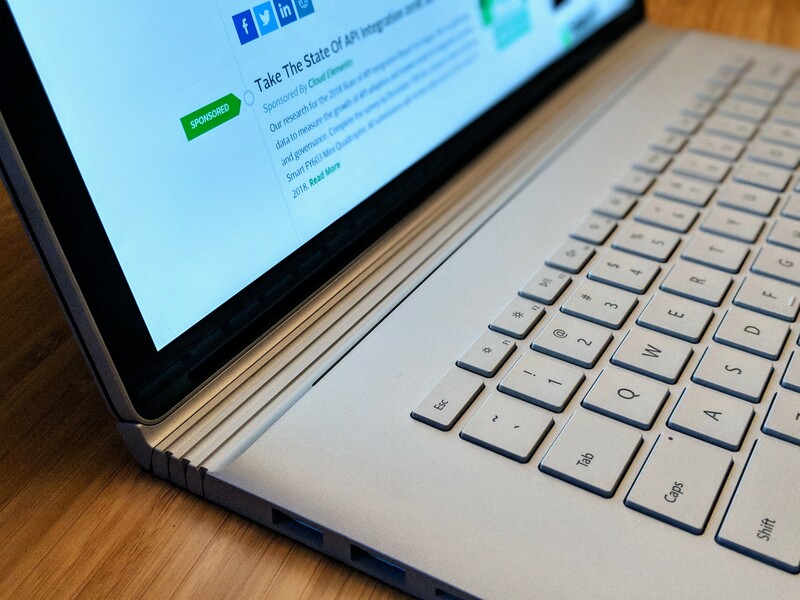 It’s Microsoft’s challenger to the MacBook Pro and it’s not shying away from the comparison. I’ve only had the Surface Book 2 on my desk for just over 24 hours, so this isn’t a definitive review (I have barely been able to run the battery down once in that time, after all). We’ll do that in a week or so, after I’ve had some more real-world experience with it. Even after a short time with the new Surface Book, I’ve come away impressed (anything else at this price would be quite a disappointment, of course). 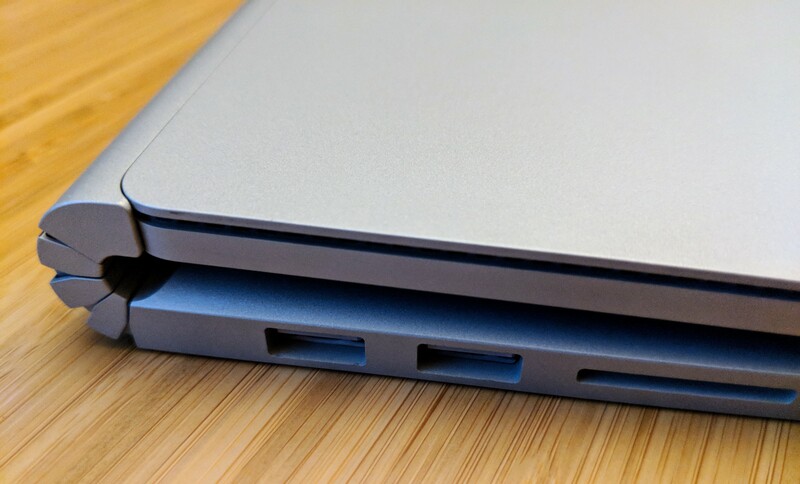 We can argue about its design — that rounded hinge that leaves quite a gap even when the laptop is closed wasn’t everyone’s cup of tea when the first version launched and while Microsoft has tweaked the hinge, the gap is still as prominent as ever. You may even call it ugly. But it sure makes it stand out in this crowded laptop market. What you can’t argue about, though, is the overall quality of the build. The base is a solid piece of metal. The tablet/screen is securely attached to it (and the keyboard has a key that releases it from its base). The large chiclet keyboard has enough travel and gives you a good indication that you’ve pressed a button, making it quite comfortable to type on. The touch-sensitive screen is bright and at a resolution of 3240×2160, you’re getting a higher pixel density than on the MacBook Pro. Thankfully, Microsoft and the software developers in its ecosystem have fixed most of Windows 10’s issues with high-density displays, so you can actually now enjoy the experience. The screen may just be a bit too glossy for some (too many laptop screens these days are), but it’s winter in Oregon and we won’t see the sun until next year, so I haven’t been able to test that. Let’s talk about the key feature of the Surface Book 2 for a moment: the detachable screen. It’s surprisingly light, especially when you consider that it’s a 15-inch tablet with a promised five-hour battery life. But is it more than just a novelty? Microsoft argues that you can detach it and use it as a tablet, fold it around to go into “studio mode” for comfortable sketching, or detach the screen, turn it around, re-attach it for mobile presentation. Some of these feel like niche use cases and I can’t quite see myself doing any of this on a regular basis but that’s probably a personal thing. I’d be quite happy with the Surface Book 2 if the screen didn’t detach, too (though at a lower price). The power of the dedicated GPU should make for a pretty good gaming experience (though not at full resolution and the highest settings — it’s not a 1080, after all. We’ll run some benchmarks in the next few days. Oh – and if you’re worried about having to use dongles for this laptop, don’t worry. It comes with a USB-C port, two regular USB-A ports, an SD-card slot and the usual Surface connector for charging and attaching the Surface Dock if you have one. And there’s a headphone jack, too. There’s no Mini DisplayPort like in the first-gen model, but you can connect up to two 4K monitors at 30Hz or a single 4k monitor at 60Hz via the USB-C port — or via a Surface Dock, of course. You can’t drive four screen by using both the USB-C and Surface Dock simultaneously, though. What about the negatives? The fan, especially in the screen, tends to kick in a bit too often. It’s quiet but noticeable, even when the CPU load isn’t all that high. The screen can also get a bit warmer than I’d like. It’s also heavy. At 4.2 lbs, you’re not going to have to double-check that it’s in your backpack. And there’s the design with its odd hinge — but I already mentioned that. Unlike the first-gen Surface Book, this one doesn’t seem to suffer from the regular blue screens of death and other issues that buyers of its predecessor had to deal with. I hope that remains true as I continue to use it. Microsoft is clearly making a play for disgruntled MacBook users by throwing in a three-month subscription to Adobe’s Creative Cloud Photography plan for the next two months, talking up how well Autodesk Maya and other apps work on the Surface Book 2, and — most importantly — by simply making this a high performance machine. So will the Surface Book 2 get MacBook Pro users to switch? That probably depends on how much you love/hate Windows 10, but it strikes me as a good — and far more powerful — alternative to Apple’s current mobile offerings. And it’s copious amount of power that sets it apart from the masses (plus its detachable screen, but I just don’t know how big a selling point that’ll be for potential users). The new Surface Books are available for pre-order now and will start shipping tomorrow.